when we fill our tanks (esp the rear) i'm constantly worrying about having fuel "erupt" out of the filler hole. it mostly happens when we have to use the large diameter nozzles. i've tried going really, really slow but even this is no guarantee. i assume it is due to air not being able to escape thru the overflow preventer and vent. i assume others also have this problem. if so has anyone found a fix or a workaround? has anyone had the preventer stick partially shut? It's a real challenge for all PDQ owners. 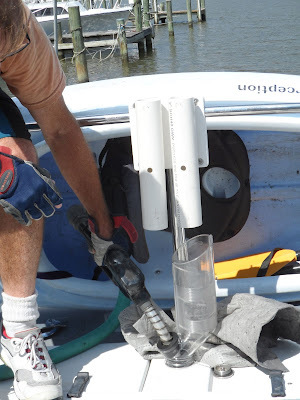 We tell our charter guests to do what we do... pump fuel slowly and watch the fuel tank gauge carefully; and STOP filling when the needle is steady on FULL. Do NOT try to completely fill the tank. You might try a Clean Way Fuel Funnel. I've used one and it worked pretty well. Yup, that's my PDQ at the fuel dock. They come with a set of addapters, up to some big sizes. If it works for you, let us know! The problem lies with the vent hose. We needed to adjust ours so that there was a constant rise toward the vent. Most of them have a dip in the hose, which allows fuel to collect in the dip. It may take several small blocks to elevate portions of the hose to insure a constant rise. You can also place a device in the line which prevents fuel overflow. We use the clean way fuel filter and this eliminates the mess with the “burping “ problem. what kind of fill rate with the big nozzle hoses can you use with the filter(i.e. wide open, 1/2, 1/4)? we actually looked at these about a year ago but decided we didn't need. we're re-thinking the whole problem. i'm going to trace the vent hose and check for low spots. i can see where if there is fuel trapped in the hose, the pressure will force it up the hose to the overflow preventer which will "close" and force the air/fuel to escape up the fill pipe. to those of you who have the funnel. i bought the funnel kit. included in the package is a tube of permetex dressing. what does that get applied to? My solution is to fill the forward tank and transfer to the rear. Have had very little burping on the forward tank. Takes some coordination depending on how much fuel I am taking on. i actually like that. we too also have less trouble with the forward tank. the issue is when you need to fill both. i can't sit at the fuel dock pumping front to back....or maybe i can. i haven't thought about it. on another note, we bought the funnel. we filled both tanks once using the funnel. i would say it's a 95% solution. we had on burp on the back which would have been a disaster w/o the funnel. the missing 5% has to do with the fit of the filler. we're working on that. overall an improvement and i would recommend.